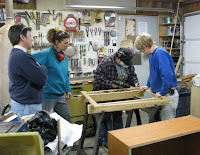 Kay Pomroy (at left) retired from the police force a little over two years ago and opened a woodworking business, called K E Pomroy Custom Woodworking, and later changed the name to Morgaine Rosewoods. 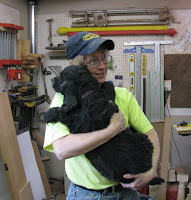 Morgaine is the dog/teddy bear clinging to Kay in the photo. 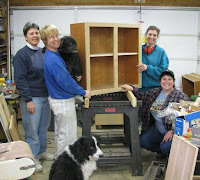 Kay not onl y builds a number of different products for sale, she teaches woodworking at her two shops and at the local Woodcraft Store (I'm taking her woodturning course), and she provides opportunities for others to learn woodworking through apprenticeships and through a volunteer-supported program she developed that helps people in need, called the Reaching Down Project. I'm convinced that Kay has been given more hours in the day than the rest of us. Ei ther that, or she has given up sleeping altogether. When Kay first opened for business, a friend who works for a school told her about several kids whose families couldn't afford beds for them. She offered to build the beds, recruited a few friends to help, and in just a few weeks, had finished beds for all the kids by Christmas that year. Ever since, Kay has found other people who can benefit from her program. Her current project is for a local family that's struggling to make ends meet. She's building kitchen cabinets for them—something they do not have—and invited the women's woodworking club to spend 2 days helping with construction. 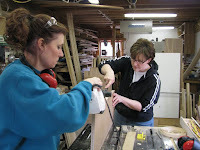 The women learned a number of things including routing dados, using the table saw and miter saw, drilling holes for adjustable shelves, pocket hole joinery for assembling face frames, and attaching edge banding to plywood. That is the closest I've been to an iron in 6 years. 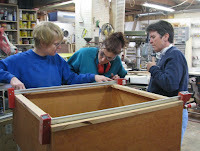 We worked on 3 upper cabinets made from cherry plywood and hardwood, each of which will have 2 shelves and doors. We didn't quite finish because Kay spends a good deal of time on instruction. It's important to her that people learn woodworking as a skill. So, not only will the family benefit from her generosity, we benefitted from the learning experience and the knowledge that we were helping others. Kay's constant shop companions, Morgaine (Cocker Spaniel) and Rex (Border Collie) even chipped in to help by sweeping the floors and providing hug breaks.